← Can You Practice Random Acts of Kindness? How Dangerous is Shoveling Snow? It is the New Year and also for many of us the onset of snow shoveling season. Please be aware that in terms of your body shoveling snow is not a totally innocent activity. While I strongly support calorie burning exercises to build up your cardiovascular system and other benefits, it is important to know your limits. If you are not currently working out or don’t consider yourself to be “in condition,” please think twice before you grab that snow shovel and race out to clear the walk. The American Journal of Emergency Medicine reported that more than 195,000 people were treated in U.S. Emergency Rooms for snow-shovel-related incidents from 1990 to 2006. This is an average of 11,500 individuals per year. Keep in mind that this information only covers folks who actually went to the ER for treatment. Plenty more stayed home and nursed their wounds …. About 2/3 of these incidents occurred among males. Children younger than 18 made up 15.3% of the cases. Older adults (above 55 years) accounted for more than 20%. The most common diagnosis was soft tissue injury. Injuries to the lower back accounted for more than 1/3 of the cases. The most common mechanism of injury/nature of medical emergency was acute musculoskeletal exertion followed by slips and falls. The study reported that snow shoveling places huge demand on the cardiovascular system and heart rates can shoot above recommended upper limits after only two minutes of activity. In addition peripheral blood vessels are constricted in freezing temps which further stresses the heart. The study recommended that folks warm up before shoveling and individuals with a more sedentary lifestyle consider hiring someone else to do it. Personal observation. I know this from resistance exercise: Don’t lift the heavy shovel and strain against a closed airway (don’t hold your breath). This is very dangerous. It can make your blood pressure shoot up and then drop suddenly. Here are Roy Berendsohn’s 16 Cardinal Rules for Snow Shoveling from Popular Mechanics. WikiHow has a nice article on snow shoveling along with a video. • If you have a history of heart trouble, do not shovel without a doctor’s permission. • Do not shovel after eating or while smoking. • Take it slow! 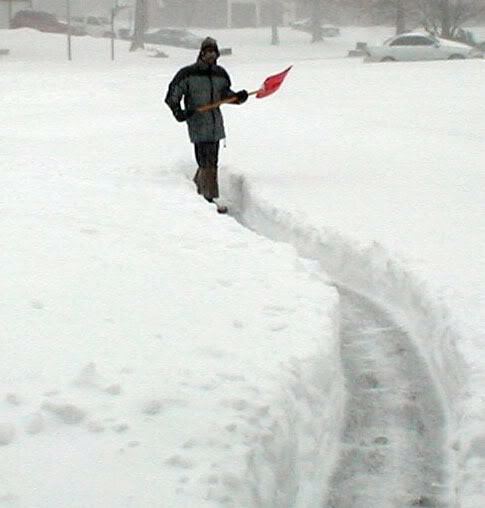 Shoveling (like lifting weights) can raise your heart rate and blood pressure dramatically; so pace yourself. Be sure to stretch out and warm up before taking on the task. • Shovel only fresh snow. Freshly fallen, powdery snow is easier to shovel than the wet, packed-down variety. • Push the snow as you shovel. It’s easier on your back than lifting the snow out of the way. • Don’t pick up too much at once. Use a small shovel, or fill only one-fourth or one-half of a large one. • Lift with your legs bent, not your back. Keep your back straight. By bending and “sitting” into the movement, you’ll keep your spine upright and less stressed. Your shoulders, torso and thighs can do the work for you. • Do not work to the point of exhaustion. If you run out of breath, take a break. If you feel tightness in your chest, stop immediately. Check their site for the complete list. I am reblogging this as a public service to remind all of you that shoveling snow is dangerous business. This latest storm has dropped tons of snow on the nation. Please read this and think twice about charging out there and tackling your driveway/sidewalk.